Coindirect has started paying out cryptocurrency to people who are referring new users. There is now a smart way to create an additional revenue stream for yourself with Coindirect’s recently launched Affiliate Program. The peer-to-peer cryptocurrency trading platform is rapidly expanding its global presence and is looking to reward advocates with daily payouts to their Coindirect wallets. 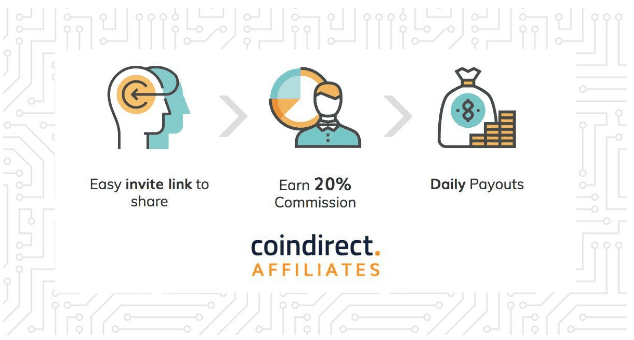 By joining the Affiliate Program, users are able to earn a 20% commission on trade fees (for buying, selling or converting) from all their referrals going forward. That means the more your referrals you have, and the more they transact, the more you’re earning. The rapidly expanding trading platform is now operating in over 20 countries in order to appeal to the global demand for an easy and safe solution to buy, convert and sell over 30 of the top cryptocurrencies. If you’re in the cryptocurrency space, or know people who would be interested in a quick and secure solution to peer-to-peer trading, you’ll want to be part of this Affiliate Program. The most important thing you’ll need to get started is a Coindirect account. The process is simple, free and quick to set up. You’ll need to provide a valid email address, a secure password and some additional basic personal information to let the Coindirect team know that you are not a robot. Once completed, you’ll have permanent account that you can use for buying, selling, converting and storing over 30 of the top digital cryptocurrencies. Purchases over a certain value (depending on the currency and country you are buying in) will require an additional verification step for Coindirect to comply with international best financial practices. For an existing Coindirect user, joining the Affiliate Program is a one-click step. No additional sign up details, no waiting period and no fees. Just daily cryptocurrency payouts based off the commissions from the referral transaction fees. Once activated, the Affiliate Dashboard provides you with a unique link that you can share. This can be linked to on your site, shared on social platforms or sent onto friends via email. This dashboard also tracks the commissions you earn from the transactions completed by your referred users. The payouts will be in the base currency of the original trade and will appear on your Coindirect account in the relevant wallet. 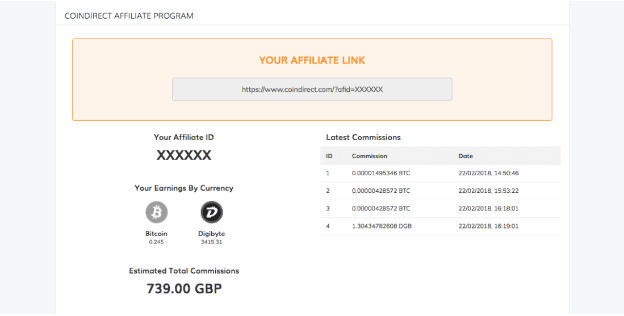 The Affiliate Program is able to track each referral registered from a unique link provided to you. From that point on, you’ll earn from every single trade fee going forward. This means you can create an ongoing revenue for yourself based on the trades of people you’ve recommended to the site. Being a blogger, vlogger, or social media influencer will help, but even a small handful of quality referrals can contribute towards earning significant cryptocurrency payouts to your Coindirect Wallets on an ongoing basis. The more referrals you’re able to secure, the larger your ongoing potential earnings will be once they start making trades on the site. By providing their user base with the opportunity to earn an passive income, Coindirect hopes to expand their global cryptocurrency community even further. Sharing the success of a growing international community is the platforms way to show appreciation to it’s biggest advocates where it counts the most, their wallets. Activate your account now and begin building up your referrals with your Affiliate link.